From WKYC-TV 3's 50th Anniversary special October 27, 1998..Del Donahoo, joined by Romona Robinson in the final portion of the special with Del's closing comments and the end credits, superimposed over some clips from Channel 3 personalities of the past..This is my own first attempt at a YouTube video..I hope to do more in the future once I can figure out how to edit videos down to usable size..This comes from a VHS copy of the special as it originally aired..
Quick Note on You Tube..
TV Guide ad for "My Little Margie" reruns on KYW-TV 3..This was in the week of January 11-17, 1956..Notice the notation "Formerly WNBK"...WNBK changed over to KYW-TV 3 at noon Monday, January 13, 1956. We may have a posting or two soon on the original Cleveland/Philly swap..as we did last year on the swap back in 1965.. I thought we'd share another of our relatively rare postings on Radio... 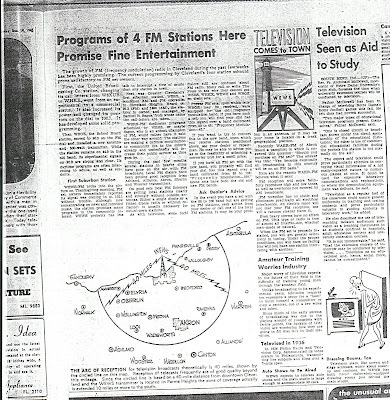 Focusing on Cleveland AM/FM radio the night before WEWS-TV 5 signed on the air for the first time..The last night that Cleveland would be a "Radio-only" city. Cleveland radio personalities of the era included Jimmy Dudley of WJW-850, Tom Manning at WTAM-1100, Bob Neal at WGAR-1220 and Dorothy Fuldheim, already doing commentary at WEWS-102.1 FM in advance of Channel 5's sign-on (WEWS-FM had only been on the air about 3 weeks at this time) The main AM stations in Cleveland were joined by WSRS 1490 and WJMO 1540..As well as a number of FM statons.. I would love to have heard WJMO-1540 is this time period..seems like it might be quite entertaining..
1964-1967 Network Cartoon Shows-"Brought To You By"
These are parts of openings to Cartoon shows from the 1964-67 era..With the "Brought to you by" tags..Courtesy of 12TVcartoons from YouTube.. Here's something I never thought i'd see..A Pilot episode of "How Do You Like Your Eggs?" experimental game show done for 200 Warner Cable Columbus, Ohio customers..They were experimenting with a 2-way interactive Television system called "Qube" in Summer 1977..The producer actually went to a Syndicated "To Tell The Truth" taping and talked Bill Cullen into coming down to Columbus, Ohio and hosting this program...Cullen easily could have balked over coming to "small-town" Columbus, but He agreed to do it..4 Episodes were made..A part of what was the "third" pilot episode is in the "related videos"
While A lot of the production was decidedly amateur, Bill, being the pro that he was, Hosted the show as if he'd been in Columbus for years and was having a great time at it.. While Qube was phased out by 1984, another aspect of the Warner Amex System survives today..Cable Channels for specific interests were introduced..One of these Channels, "Pinwheel" evolved into what is now the Nickelodeon Channel. While I am sure Bill was compensated for his hosting this show..He was given a gift of..An Atari Pong Game!.. Thanks to Game Show Guru Adam Nedeff for posting this Gem..
Matt Ottinger's Bill Cullen Homepage has a little more about this unique show. February 1963-The beginnings of Ghoulardi..
Warren Guthrie's last year of "Sohio Reporter" would be 1963. It was said that Warren didnt care much for local news..so Doug Adair followed with "City Report" at 11:10 (Which eventually morphed into City Camera News) At this point Norm Wagy would have nightly editorials at 11:15 followed by John Fitzgetald Sports at the odd time of 11:18, followed by the night movie at 11:23. 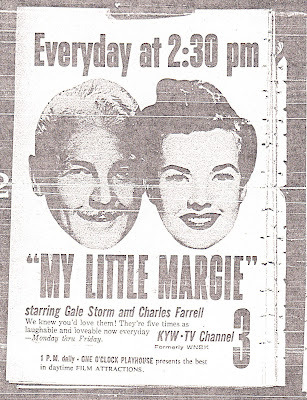 TV Guide Ad for The early evening WJW-TV Newscast with Doug Adair, followed at 7:10 by John Fitzgerald Sports and CBS News at 7:15. 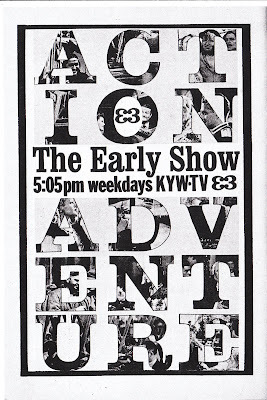 Advertisement for KYW-3's "Early Show"..The Late afternoon/early evening feature film was a staple of KYW/WKYC-TV 3 from at least 1959-into the early 1970's. 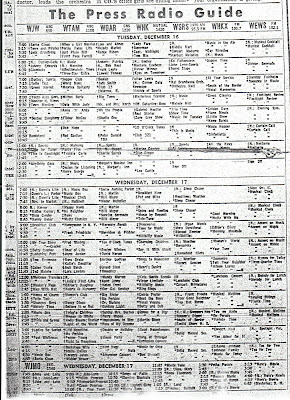 WJW-TV 8-Prime Time Monday Night lineup in early 1963. 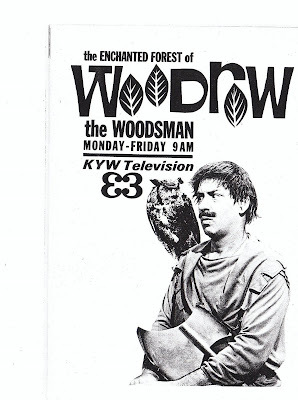 TV Guide ad for Woodrow the Woodsman (Clay Conroy)..He started out as a sidekick for "Barnaby" but proved popular enough for his own daily show..
Today we will look at February 1963..Cleveland was involved in a long newspaper strike in 1962-63 which apparently resulted in extra TV News coverage, though not apparent in schedules of the period..There was a TV Guide disclaimer that said that there may be more TV News because of the Strike.. The major programming news of the January-February 1963 period had to be the debut of TV 8 announcer Ernie Anderson's "Ghoulardi" on January 18, 1963. Anderson, a Massachusetts native who had previously hosted "Ernie's Place" Movie series with friend Tom (Tim) Conway till January 1962, was under contract to Channel 8. 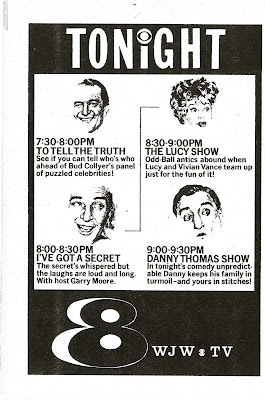 A Channel 8 executive saw Anderson emceeing an in-house Christmas party in December '62 and suggested Ernie host a series of Horror Films Channel 8 had just acquired. Costumer Ralph Guilko came up with Ernie's Ghoulardi Costume-Fright wig, Beard and dark glasses..and Ghoulardi was born..
Ernie really put himself into the part..The studio was darkened so you could only see his face..He was so popular that his catchphrases, including "Stay Sick", "Turn Blue", Ova Dey", "Purple Knif" and "Cool It with The Boom Booms" were part of Northeast Ohio's vocabulary long after Ernie was gone.. He really pushed the evelope with Channel 8 brass resulting in constant lectures "Now don't do that again". His biggest uproar came with the 11-episode "Parma Place" skit which ran most of 1966..A dead on spoof of popular ABC series "Peyton Place" Ernie played "John" a "Lake Erie Muckraker" who lived with wife Janet..There was also "Handsome downstairs neighbor" Jerry Kreegle. played by show Producer/engineer Chuck Schodowski (who had to practically be beaten up to appear on the air with Ernie)..Jerry had eyes for Janet, but John seemed oblivious to that fact.. In honor of Anderson and the TV 8 horror host tradition, Big Chuck and Lil John will host "Ghoulardifest IV" at the Holiday Inn Independence on Rockside Road..October 17-19, 2008. Some information from "Ghoulardi:Inside Cleveland TV's Wildest Ride" by Tom Feran and RD Heldenfels..Excellent Read if you can find it.. @1996 Gray and Company, Publishers, Cleveland, Ohio.